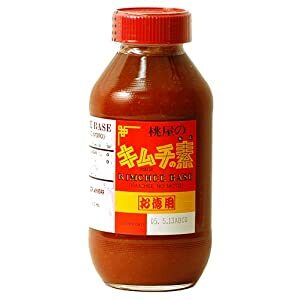 I was checking out the asian market on the way home looking for some ingredients for some ideas that I'm working on and decided to pickup a bottle of kimchee base (kimchee no moto). When I got home, I opened the bottle to taste it and I couldn't believe how good it tasted. I wanted to drink the bottle of this stuff. I decided to try it on chicken. Well, we ate it tonight and it was really tasty...not too spicy at all but very flavorful. I want to see what else this stuff will taste good on! Put chicken in a bowl, add ingredients and mix well. Marinate for at least 2 hours, grill. Super simple!